If your child snores on occasion, it's completely normal and can be easily remedied. However, if your child snores persistently, have her checked out for a more serious medical condition. Snoring in children can be a symptom of sleep apnea. 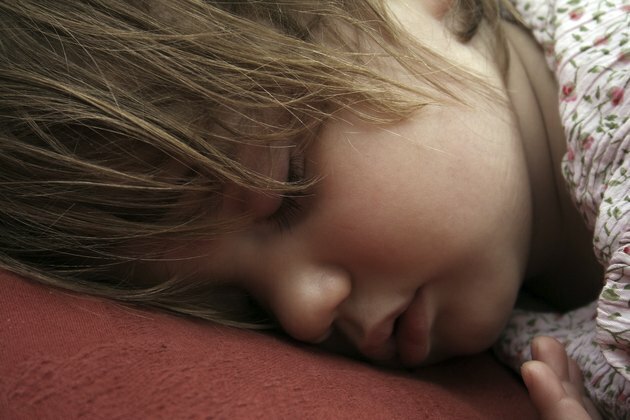 This serious sleep issue affects a child's breathing at night. During the day, she may be overtired from lack of continuous sleep and may have long-term health issues, such as failure to grow and hyperactivity. If your child snores, try a few remedies, but talk with your doctor if the remedies fail to stop the snoring. Children with Down Syndrome, cleft palates and receding chins may snore regularly. Seasonal allergies or a stuffy nose due to a cold can cause your child to snore. Using a cool-mist vaporizer can help alleviate nighttime stuffiness and snoring. Note that using a warm-mist vaporizer can cause steam burns, so ensure your vaporizer has a cool setting to avoid accidents. You can help your child stop snoring by modifying his sleep position. Try first rolling him gently on his side to see if this helps stop his snoring. Back sleepers often snore as their uvula relaxes to the back of their throat. A second sleep position to try as a home remedy is lifting the child's head and shoulders. This helps alleviate any nasal congestion that may be causing the snoring. Either place a large pillow under your child's head and shoulders, or put two books under the head of her bed to keep the bed at a small slant. If your child is stuffy due to dust allergies, add an air purifier into his room and keep the door shut. An air purifier cleans the air and helps relieve the stuffiness of allergies, which can contribute to snoring. Most air purifiers can clean continuously for a set amount of space. Keep the purifier on day and night to help clear allergens out of the air. Decongestants and a nasal wash can help keep your child's nose clear, which helps unblock the mucus that may be causing the snoring. Talk with your doctor or pharmacist about over-the-counter remedies appropriate for your child's age. You can also try a nasal wash to keep allergens out of your child's nose, as well as washing out excess mucus build up. If your child is old enough, consider using a Neti pot--a simple saline washing tool that helps drain mucus. If your child is younger, use a dropper and warm, not hot, water to flush out her nose.